When a celebrity wears a surprisingly memorable outfit, it can be difficult to forget, like Britney Spears' almost entirely transparent bodysuit in her music video for "Toxic." However, when an athlete is spotted wearing something flashy that's not sportswear, the most memorable Olympics uniforms of the 2000s go down in the history books. When it comes to Olympic athletes, spectators often put them on a pedestal. But the truth is, athletes are people, too, and in addition to being average folks with families, dreams, and problems of their own, they will also look quirky if you put them in a flamboyant costume. When I talk about "memorable" Olympics uniforms, there are a few factors that help me classify an outfit as such. For an Olympics uniform to be memorable, it must either be stunningly beautiful, hideous, or just plain bizarre. Of course, nowadays, we could look back at tons of outdated Olympics uniforms and deem them "memorable" because they summed up the fashions and trends of the time period. But today, let's delve into the archives and drag out the most gorgeous, garish, and strangely show-stopping ensembles in Olympic history. Because even athletes have good days and bad days when it comes to fashion. While some critics were not amused by Team USA's cardigans, I actually think they're quite kitsch in an ironic "my granny knitted this for me" kind of way. Is it a bird? Is it a plane? No! It's Morocco's Olympic Team looking rad in olive green capes. Well, Olympians are practically superheroes, right? The Mexican delegation at the 2012 Olympic Games was like a walking rainbow. Although Russia's delegation looked furiously festive at the 2014 Winter Olympics, they also looked adorably whimsical, too. 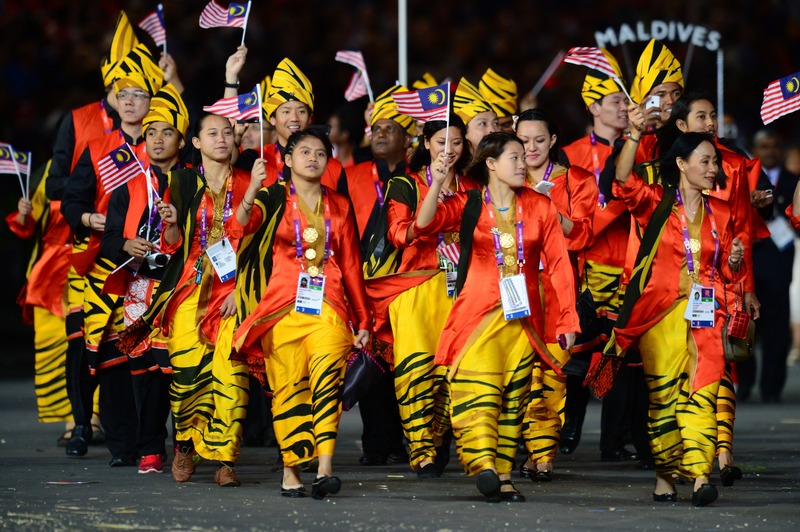 It's safe to say Malaysia's athletes were looking fierce in their tiger-striped 2012 Olympics uniforms. I'm not really sure what's going on with those kooky hats, though. Some may say Germany's 2014 Winter Olympics uniforms were garish, but IMO, they were utterly joyful. There's nothing wrong with a rainbow-colored costume. There's something a little macabre about the red pattern on Hungary's 2008 uniforms that reminds me of horror movies that don't end well. According to one of my favorite English comedians, it's impossible to be unhappy in a poncho and I reckon this extends to multicolored capes as well. Does Team Australia's 2016 Olympics uniform remind anyone else of the Saved By The Bell gang's uniforms? You know, the ones they wore while working at the Malibu Sands Beach Resort? Although not technically an Olympics uniform, Johnny Weir needs a special mention for wearing a swan-inspired costume at the Torino 2006 Winter Olympic Games. Because let's face it: Nobody will ever look this elegant while wearing a single red glove.